"Aging in Place" means continuing to reside in the home where one has lived for years, within the community that is familiar and comfortable, as a resident advances into old age. When aging residents receive assistance in their own homes with transportation, cleaning and cooking, visits from health care workers, assistance with maintenance and help with other services, congregate or institutional care can be postponed or avoided. As opposed to greenfield construction of large institutional type living arrangements, aging in place makes use of existing dwellings and community resources. Municipalities can help residents age in place through their regulations and policies. Cost efficiency: According to Kaiser Health News, nursing home care is more than five times as costly as providing services to elders living at home. 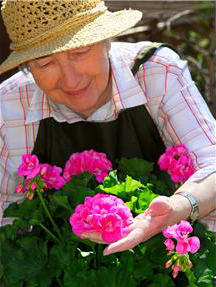 Elders remain in the community, thereby enriching the individual's and the community's experience. Environmental protection: Aging in place helps to defer new greenfield development, thereby conserving and protecting valuable natural resources. Supports an aging population: Aging in place can help accommodate the projected growth of Americans 65 and older — a figure expected to more than double to 89 million by 2050 is significant and providing accessible housing for the elderly will be one of the nation's greatest challenges. Supporting elderly individuals to age in place will serve to meet some of that forecasted housing need in a cost-efficient manner. Reduces energy demands: The use of existing housing stock reduces the need to expend energy in new construction. Demand for social services: Social services will be dependent on mobile access to individual dwellings as the residents' own mobility declines. Families and community groups must commit to providing in-home services to elders, and service needs will become more comprehensive and intensive as the residents age. Emergency services: Emergency service providers will need to maintain current lists of dwellings with elderly residents, who may be dispersed within the municipality. Varying abilities: Not all elders can safely and securely remain in their homes. Some will need a higher level of assistance. Maintenance: Home and property maintenance usually becomes more difficult for elderly homeowners to manage over time. Elders aging in place and living alone may be more susceptible to deceptive financial practices or possibly elder abuse. Implementation of an aging in place system may involve building code updates or municipal ordinance amendments to allow more appropriate structure and lot standards for accessibility modifications. Increased access to public transit must be considered to connect the elderly to medical and other services. The most critical component for sustaining aging in place systems is the presence and involvement of a local senior center. Chester County is fortunate to have many active and well utilized senior centers. There is a broad array of services and programs offered including those providing direct assistance to elders who remain living in their homes. A significant volunteer corps is needed to implement the in-home support services. A support system is also needed for family members or other caregivers of those elders aging in place. Supports may include respite care, adult day care, or flexibilities in work schedules or work adjustments provided through the Federal Family and Medical Leave Act granted by employers for the care of an aging parent or other relative. The Downingtown Area Senior Center in the Borough of Downingtown, runs a daily program it calls "Downingtown Delivers." Through this program, the Senior Center provides meals to eligible, home-bound residents who are 60 and older and who reside within the communities of Downingtown Borough, East Caln Township and parts of Caln, East Brandywine, Wallace, West Whiteland and Uwchlan Townships. Meals are prepared on-site at the Downingtown Area Senior Center and delivered to the clients' home at the lunch hour. Clients may also receive other senior center benefits, including yard work, application assistance, and benefits counseling.